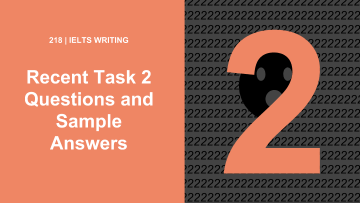 In this tutorial we look at 5 Task 2 questions (2019), seen on the exam recently by students. 1.) The media is increasing interest in famous people who have ordinary backgrounds. Why do you think people are interested in the lives of famous people? Do you think this is a good thing? 2.) Successful companies use advertising to make more sales. What can make an advertisement very effective? Do you think this is a bad thing or a good thing for the society? 3.) Science will soon make people live up to 100 or even 200 years. Some believe this is a good thing while others disagree. Discuss both views and give your own opinion. 4.) Some people believe that it’s not necessary to have internet access to live a full life. What is your opinion? Give reasons for your answer and include examples from your own experience. 5.) In many countries, prison is the most common solution for crimes. However, many think that better education is the most effective way to prevent people from committing further crime. To what extent do you agree or disagree. You’re most welcome, Krishna! 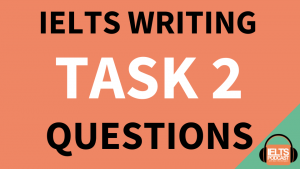 Are you struggling with IELTS Writing Task 2? Really very useful for IELTS taker. Thanku so much. You’re most welcome, Sukhbir! When are you going to take your exam? Do you need a hand? Hi, you mention sample answers, which accompany the questions, and would prove to be a very helpful resource. I can’t seem to locate them on this page. Hi Lesley! Please watch the video or listen to the podcast for the full tutorial. It includes the questions and answers.